Vascular Laser or V-Beam Laser is a laser technique used by dermatologists to cure various skin conditions like Rosacea, Birthmarks and Measles. It is a highly intense beam light, which treats the blood vessels below the skin. Laser light penetrates the outer layers of the skin to reach the blood vessels below. Then, the targeted blood vessels selectively absorb the energy in the beam and get destroyed by the brief but intense heat created. Thereby, the body removes the damaged vessels gradually normalising the skin’s appearance. During the procedure, the surrounding skin cells are taken care with utmost precision. Vascular laser can treat a number of dermatological infections like Rosacea, Spider Vein and Port Wine Stains. The V-Beam is also accountable for eradicating warts, measles, facial veins, broken capillaries, bruises and telangiectasia. 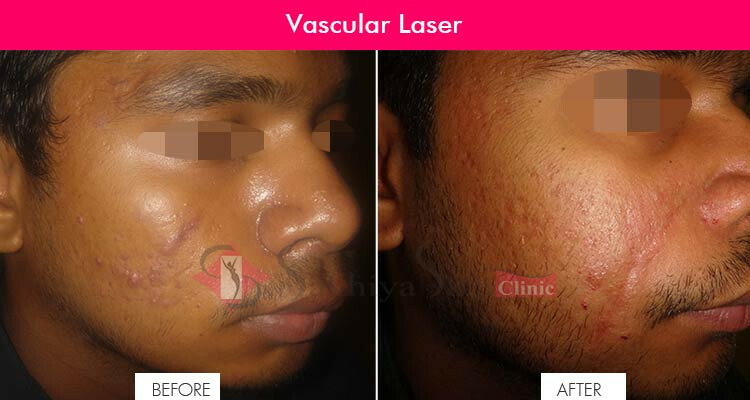 Vascular laser is the most famous and appropriate method that is liable for the removal of vascular lesions. The vascular laser system uses a pen like handle, which traces the blood vessels and the red marked spots and patches. The laser delivered on the skin is absorbed by the blood and after that it is converted into heat energy. This heat tries to coagulate the blood vessels shrinking them further. Due to which, the redness or the spots get diluted. Vascular laser method is mainly absorbed by oxyhemoglobin in the blood vessels. This concept uses two sensations, one for heating & removal of blood vessels and the other one for cooling it back, which lessens the discomfort caused initially. Usually, no anesthesia is required while performing this therapy. Vascular beam is very effective and safe for the people suffering from rosacea and red birthmarks. It is advised that you must take into consideration your health history before opting for vascular beam laser treatment. This method is strictly not allowed for pregnant women or for individuals suffering from cold sores or related problem. V-Beam is not as painful as other laser methods. It is counted as one of the safest methods. However, little bit of scarring and blisters can be felt by the patient. Causes: V-Beam is used for many causes like- rosacea, facial capillaries, red stretch marks and hemangiomas. HOW DOES VASCULAR LASER WORK? Laser light penetrates the outer layers of the skin to reach the blood vessels below. Then, the targeted blood vessels selectively absorb the energy in the beam and get destroyed by the brief but intense heat created. Thereby, the body removes the damaged vessels gradually normalising the skin’s appearance. WHO IS SUITABLE FOR VASCULAR LASER? Patients having broken capillaries on the face, port wine stains, spider veins, veins around thigh area, persistent redness on the face, acne prone skin, rosacea or bruised – are all suitable candidates for vascular laser treatment. It is a safe non surgical alternative for most of the patients.